Receive 3 month’s of care packages from BuddhiBox – filled with a curated assortment of unique and artisanal yoga products. Your full-size yoga products will be from different categories, including fitness, skincare, and fragrance. You’ll get to try staff favorites, product launches, and more. Designed with the yogi lifestyle in mind, each box contains ethically sourced, cruelty-free products that embody the yoga principles of compassion, community and discovery and a portion of its proceeds are donated to a different charity every month. 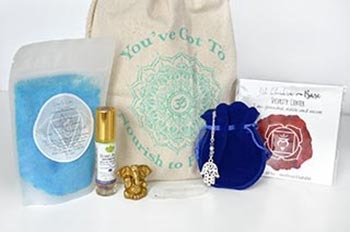 Find out more about BuddhiBox subscription boxes here. Enter every day December 8th – 12th to increase your chances to win! The idea came after teaching an intense, detoxifying hot yoga session. During class Maxine soothed a student’s achy back with therapeutic gel. After class the student came up excited and asked her what it was. They loved that there was a product out there that helped ease their pain. I then offered organic hand sanitizer to clean off sweat & germs to a fellow teacher. They loved that it was all natural and aromatic and asked me where I got it. As I was driving home I thought about how useful these products were to my yoga teaching and yoga practice. And how by sharing them, it benefited others. Read more about BuddhiBox and their mission on their website.